I had a dream that I was going down a lonely road in an old, rattle-trap cart. 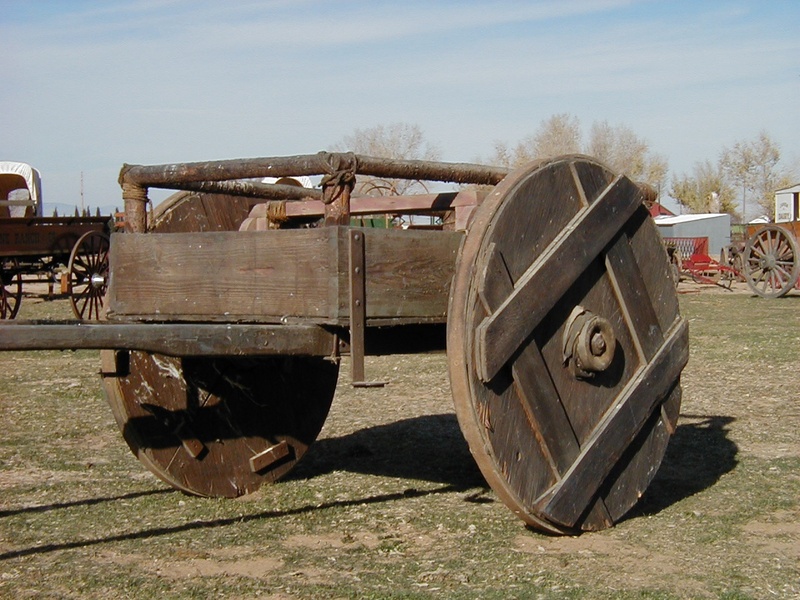 It was a very bumpy ride, which was frequently brought to an abrupt halt when one of the wheels fell off. In addition to being small and uncomfortable to ride in the cart was old and shabby to look at. Though it was foggy I could see many ugly patches on the cart. I was filled with self-pity. How had I come to be riding in such a pathetic, old cart? Why was I slowly bumping along an empty, dirt road in the middle of nowhere? I envied those who were fortunate enough to be swiftly riding down well paved interstates in luxurious speed. Oh, how I wished I had the Mercedes and smooth road. I was so cramped in my little cart that when the wheel fell off, as it frequently did, I could not get out of the cart to put it back on myself. The wretched cart held me fast. I had to sit still until someone came to help put the wheel back on my cart. My impatience to be off, along with my shame over having ridden in such a wretched cart caused me to be less than courteous to my assistants. After the wheel was fixed off I went, rattling along again. I regret to say that on more that one occasion, being in such a hurry, I whipped at the front of the cart, For though the fog hid the beast, I was sure from the slow pace and the condition of the cart that it must be a pathetic, old mule, or some such dismal creature that was pulling my broken old cart. After a time, I noticed that it was often the same people who came up from behind to fix the broken wheel. Being in a more appreciative mood on day I asked my helper why they didn’t just get into the cart and ride with me since we seemed to be going the same way. My offer was graciously declined. The poor souls preferred to walk. My progress was so often halted that the walkers were always catching up with the cart when the wheel fell off. Though I had a sometimes lonely ride I considered myself better off than the walkers, Unfortunately, I was frequently loosing a wheel or getting stuck in the mud. The walkers pushed with all their might to get me out of one bog, yet they never gave up or passed me by. After spending a long, cold night with a broken wheel, one of my fellow pilgrims came up to help me again. “If you don’t want a ride, that’s fine. It’s cramped in here anyway, but why are you following along behind me?, I asked. My assistant looked surprised at the question and replied, “I’m not following you. I’m following Him.” I looked at the front of the cart as he pointed and for the first time the fog cleared enough that I could see it was not a mule harnessed to my cart but a man. Here was a tired looking, ragged man, with sweat and blood running down his face, holes in his hands, feet and side, and a crown of thorns upon his head. Jesus, the Christ, the Son of God was pulling my broken cart!I wept with tears of guilt and remorse at how bitterly I had complained about being in such a broken, old cart. I had taken out my frustration on the slow speed and inhospitable road on the one who had never left me despite my ill-usage and self pity. Now freed from my folly I was able to climb out of the cart and worship at his feet. “My child,” he said, “Can you take up your own cross and follow me?” I fell into walking with the other pilgrims as we followed him down the narrow, ill-kept, dirt road. He never walks unharnessed. He is always finding someone in a broken down cart to pull. It is much easier to walk than it was to ride in my old cart. We walkers help to pull carts out of the mud and repair their broken parts. All the while we keep our eyes on the Master, the humblest and most broken looking one on the road, Yet he alone has the strength to pull a cart. He can and does. And we follow the humble Master who leads us home. Sometimes I am in the broken cart. Sometimes you are the one creaking along. We all ride in its’ miserable confines at one time or another. When we are strong enough we get out of the cart and follow on foot. When you’re stuck in the cart remember you’re never alone. Christ is pulling you.